This shot is lit only by the light of the moon, stars, and Megan's Parent's house. Exposed for 4 minutes at F22 with the Canon EFS 10-22 lens. 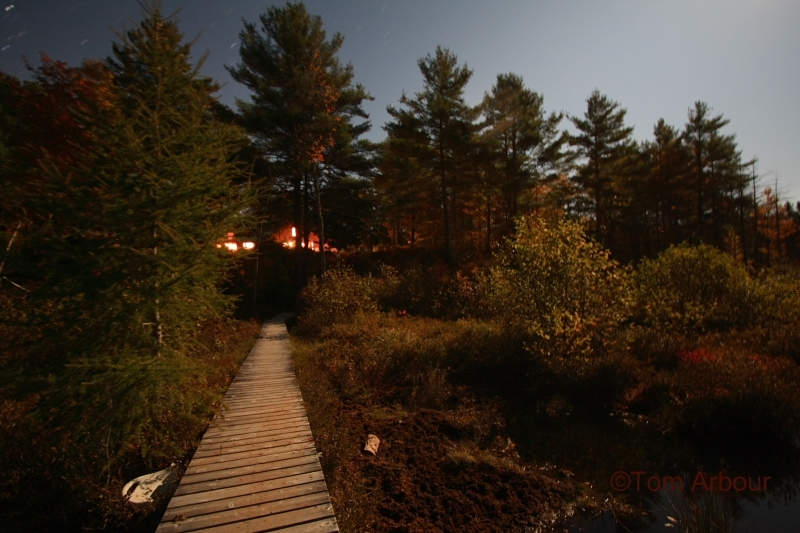 What an amazing place little pond is, and this was the first time I captured the bog and boardwalk at night. The moon bright, the sky was clear, and I didn't even need a flashlight to set up my camera. Notice how the boardwalk is sharp, but the rest of the image is definitely soft. The wind probably moved the vegetation, resulting in the soft background but the boardwalk and soupy wet peat weren't moving at all. The question here? What is that white thing to the left of the boardwalk? I should have taken it out of the photo when I shot this one, but it wasn't bright enough to see everything. Any guesses? A hint: the pond is right behind the camera, at the end of the dock. To see a larger version on black, as always, go here. Ooh, ooh, I know! It's something "pondy!" Lana- You're pretty much on the right track. I know what it is! I'll let other people guess first though- I might have too much first-hand knowledge...the house looks gorgeous. Tom: A really neat shot and amazing that you did it by moon light. I was thinking the same thing as Lana, definitely plastic and may be a cover. And the mystery object is: The seat back to a peddle/paddle boat. It always seems to be floating around the bog rather than being on the boat itself. Crazy. Too late to guess...good thing, because I had no idea what it might be. Great job on the light in the photo. You were very brave to be out at night on a pond that's inhabited by a haunted paddle boat seat. Welcome Back, Tom! Very nice photo, and I'll bet it was even more mesmerizing in person. There's something enchanting about a moonlit night that illuminates even the foliage, such as in your capture! 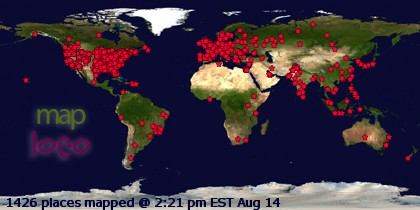 Thanks everyone. Yes, it was a little spooky down there. To be honest, I was most afraid that I would somehow kick a leg of the tripod and I and the camera would go falling into the pond. Now that really would be scary!